The Bach Flower Remedies are a type of "vibrational, or energy medicine" that were developed in the 1920's by Edward Bach M.D., an English physician and homeopath. Bach believed that mental attitude played a vital role in maintaining health and recovering from illness and began to diagnose and treat conditions clinically based on a person's emotional states rather than their actual physical symptoms. 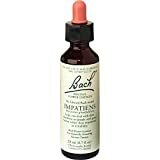 Bach Flower Remedies are available as liquid tinctures. Dr. Bach identified 38 basic negative states of mind and created a plant or flower based remedy for each one. The essences are made from the flowers of various plants. The flowers are placed on the surface of a bowl of spring water for several hours in sunlight. Bach's theory is that this method would "charge" the water and create a "vibrational tincture". Because Bach Flower Remedies do not contain any of the original substance used, only its "vibrational pattern", the Bach Flower Remedies are considered to be different from homeopathic remedies (which contain minute amounts of the original substance). The 38 Bach Remedies are prepared from wild flowers and the blossoms of trees, except for one remedy that is made of water from a healing well. The remedies come as a liquid, preserved in brandy. The remedies can be taken individually, or up to 7 remedies can be combined together at the same time. They are taken by diluting two drops of each remedy into a 30ml dropper bottle, topped up with mineral water, and then taken as four drops four times a day. Alternatively, the two drops can be added to a glass of water, and sipped 4 times a day. 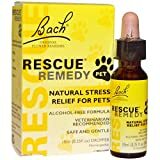 There is only one Bach Flower Remedy which is a pre-mix and it is called "Rescue Remedy". The Rescue Remedy was devised by Dr. Bach to be used mainly in emergency situations or after an accident, physical injury or shock. The Rescue Remedy is made up of five of the Bach remedies: Clematis for faintness, drowsiness and sleepiness; Star of Bethlehem for shock; Rock Rose for extreme fear of terror; Impatiens for irritation and frustration; and Cherry Plum for extreme mental pressure.